Rich grew up as a TEAM MK in Zimbabwe and came to faith in Jesus as a young boy. Through his teen years God was tugging his heart toward full time Christian service so with that in mind he attended Northeastern Bible College in New Jersey, USA. During those college years through diverse exposure to and involvement in missions God confirmed in Rich that he should return to the mission field. About that time God brought Anne back into his life. Anne, an Australian MK from DR Congo, and Rich had not seen each other for 5 years since high school days in Zimbabwe but by God’s gracious providence their paths crossed again and their friendship was rekindled. 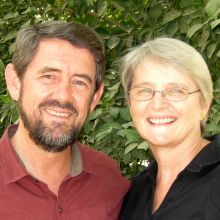 Two and a half years later they were married in Australia and after finishing seminary in Denver they began preparations for heading to Chad as career missionaries with TEAM. They arrived in Chad in October 1988. God has blessed them with 4 wonderful children, 2 amazing daughters-in-law and 3 very precious grand-daughters. Missionary life is something I’ve grown up with. Born in Zaïre (Dem. Rep. of Congo) the second daughter of five to Howard and Elizabeth Wilson, I went with my older sister to boarding school in Zambia for grade school, and to Salisbury, Rhodesia (Harare, Zimbabwe) for high school. It was in high school where I first met Richard Hoyt. (Rich’s parents, missionaries with TEAM Zimbabwe, were my dorm parents!) Seeing first-hand the medical needs in those countries, I returned to Australia and chose a career in nursing and midwifery. After 5 years apart, the Lord lead Rich and me back together, calling us both back to Africa. We arrived in Chad October 1988 after French language study in Quebec, Canada, with two little boys (Daniel & Timothy) in tow. The Lord added two little girls (Eliane & Janelle) to our family. The family has since grown to include two wonderful daughters-in-law and three precious grand-daughters! Most of Rich’s years in Chad have been spent in working with men who are already in church leadership. Using a local vernacular language, Nangjere, Rich taught Bible to these pastors and elders through seminars, classes and itinerant preaching. In the early 2000?s Rich focused his teaching on the use of the New Tribes Mission materials called Building on Firm Foundations ? a chronological presentation of God and the gospel revealed from the Old Testament through to the New Testament. After several years in Chad, Rich began to help with leadership for the TEAM Chad ministry area. In 2008 he was asked to take over the position of leader for TEAM Chad. This has been his focus since then as he works with TEAM missionaries in multiple ministry initiatives around the country, helps build ministry area vision and strategy and continues to nurture a healthy relationship with our partner church in Chad, the Evangelical Church of Chad. Caring for the family and home school was my fulltime job until the kids went to Rain Forest International School, Yaound?, Cameroon, for high school. With no children at home, my heart was burdened for women vulnerable to HIV infection, and so together with some Chadian leaders we began teaching HIV/AIDS awareness seminars among the Nangjere speaking churches of the Evangelical Church of Chad. This ministry was very well received as it brought hope and a biblical perspective to the HIV epidemic leading to a greater openness, acceptance and loving response to those infected or affected by the AIDS virus. With a move to the capital city of Ndjamena in 2008, the HIV/AIDS education ministry has continued into other language groups. Then when the need arose for a partner for a missionary reaching out to vulnerable women (women in prostitution or married to unfaithful men) in the city, it was a natural response that I should become a part of this ministry as well. I continue to share God?s love with these girls who are so broken and hurting, as well as continuing the HIV education ministry as the opportunities arise. Pray that God would give much wisdom and grace for leading our TEAM Chad ministry area in these days of great opportunity and challenge. Pray for church leaders to understand the cultural drivers behind the HIV epidemic so they can address them from a biblical perspective. This would result in loving outreach to those infected, increased education among the youth, HIV infections prevented and lives saved through correct treatment. Pray that those of us involved in reaching out to women vulnerable to HIV infection, that we would buy up the opportunities given to us, and that lives be radically changed through faith in Jesus.